Dear Junior Lifeguard Families and prospective new students, Welcome to the 2019 Junior Lifeguard Program. Also please open How to Prepare for Junior Lifeguards for instructions on preparing for the first day of the program. Thank you again to the Ventura Surf Club for their generous donation to the scholarship program! 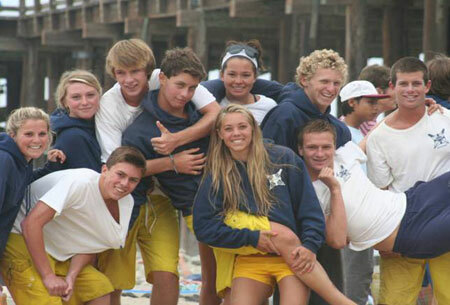 The objective of the Ventura Junior Lifeguard Program is to provide quality water safety education. Further, the program is designed to improve young people's physical conditioning, their understanding and respect for the environment and their respect for themselves, their peers and their parents. Recreational objectives are accomplished by instruction and practice in open water swimming, paddle boarding, body surfing, body boarding, surfboard riding, skin diving and self rescue. Respect for the environment is increased by the understanding gained by the student’s daily physical contact with the environment and through lecture and discussion of pertinent marine and environmental topics. Increased respect for themselves is gained through the student’s personal progress and pride in self-accomplishment. Respect for others is increased by the student’s constant contact with compassionate Instructors and by working with other youths in a team-building environment. In addition to the regular Junior Lifeguard Program, we are embracing opportunities for community involvement, co-production of City of Ventura youth events and partnerships in school classrooms. The Junior Lifeguard Program is using these special opportunities to introduce non-traditional user groups to the wonders of the marine and aquatic recreation environments. It is our hope that by offering recreational opportunities to our youth that we will increase the quality of our present and future communities. The competition team is designed for program participants that are interested in a more competitive experience with the Jr. Lifeguard Program. The Team will meet from 8 a.m. to 9 a.m. daily, except Wednesdays, for a morning workout and lifeguard specific competition skills. There will be required travel for Competitions outside of the regular Jr. Guard Program. Competition Team Participants may join for all 9 weeks. Students will travel to The Channel Islands On ISLAND PACKERS' vessels. Students will have a chance to visit the island and snorkel in the clear waters of the beautiful Channel Islands. This trip is included in the regular program fees. Check-in 8:30 a.m. Boat will depart at 9 a.m. sharp and return to port at 5 p.m.
Those particpants schedules for Harbor Cove will spend time at the National Parks Museum taking part in a Live Dive where they will have the opportunity to speak with Park Rangers as they explore the waters of Anacapa Island. We will also have kayaking and stand up paddling in the flat waters of the cove. 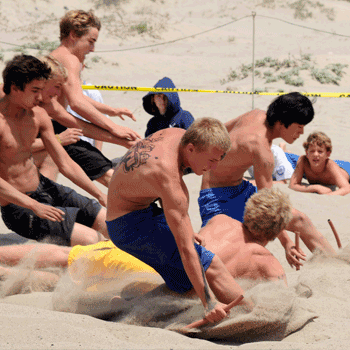 CPR (cardiopulmonary resuscitation) will take place at the State Beach. Please check program calendar to determine your particpants scheduled meeting place. There is flexibility combining family members and carpools from different groups. Former Junior Lifeguards that are turning sixteen this year and are interested in the Junior Lifeguard Assistant Program please contact the Junior Lifeguard Office April 1st to request appropriate paperwork. Tryouts will take place no later than the first weekend of May. Tryouts do not take three hours, drop-in to one of the scheduled times at your convenience. First day of the session you have registered for at 8 a.m.
Click on logo to get more info about skin cancer and this summers presenters.